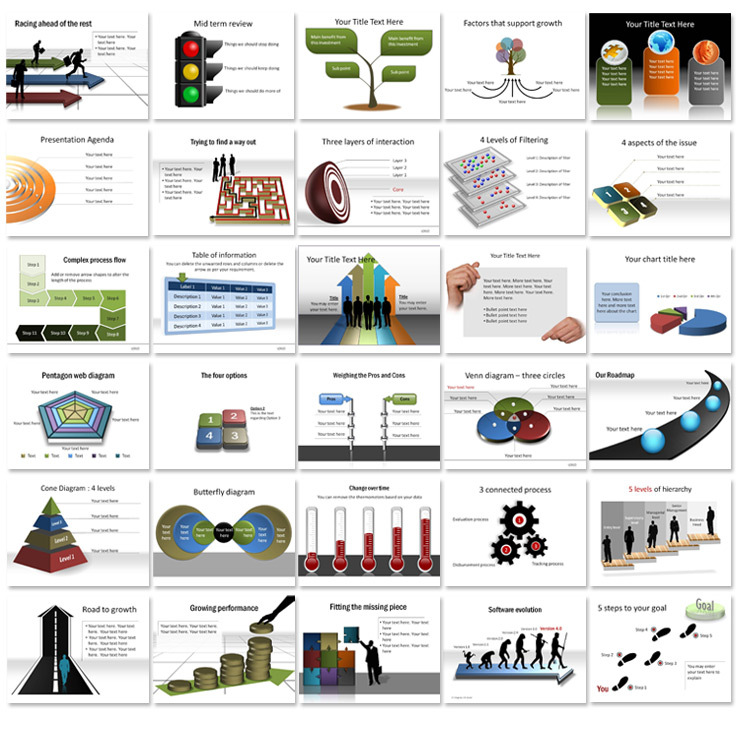 420 Fully Editable PowerPoint Diagrams! Save time and money with the complete pack of over 420 pre-created, animated, color changeable diagrams for Microsoft PowerPoint.Over 420 fully editable presentation diagrams for PowerPoint. add color-changeable to your presentation! Use Diagrams in PowerPoint without the hassle! Don't spend all your time painfully adding shapes and animations to your slides. We've done it for you. The diagrams in PowerPoint Presentation Diagrams Volumes are professionally designs and animated to help you present information in clear stages. Simply use the diagrams you need and edit the text to fit your slide. The colors will automatically change to match your PowerPoint theme. Every minor improvement in the look and feel of your slides will yield a big difference in terms of the business results you get when showing a masterful presentation. Want to use Presentation Diagrams outside of PowerPoint? No Problem! Presentation Diagrams can be applied to many other presentation programs beyond Microsoft Office PowerPoint. They are downloadable as .PPTX PowerPoint presentations but many applications such as Google Docs, Keynote, Open Office, Kingsoft Presentations and Zoho Show will read and import the slides. Upgrade microsoft PowerPoint with amazing fully editable diagrams.